The Nature Trail - Stop no.6. Time for a word of caution. Please take great care along the banks of rivers, and for that matter any body of water. As both Andrew and Paul being paramedics can sadly testify to, they can be very deceptive, dangerous places especially for children and the unwary. At our sixth stop, we find ourselves down on the banks of the River Dane. 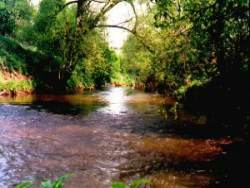 Rising in the hills of Cheshire's neighboring county of Derbyshire, the river forms the eastern boundary to the farm. 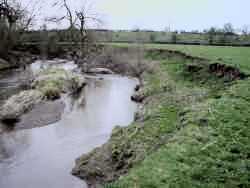 At normal flow levels, it would be possible, in places to cross in just 20cm to30cm of water. Such shallow crossings are known as "fords". Many towns with "ford" as part of the name usually indicate where such crossing points were in times past. The Dane is one of the fastest rising rivers in the country and given a spell of wet weather, you can quickly find the water level to be 2 meters to 3 meters above the level in the picture above. 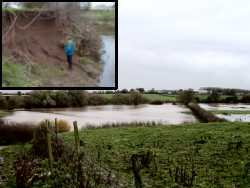 The picture to the right shows the flooding of our lower meadows. 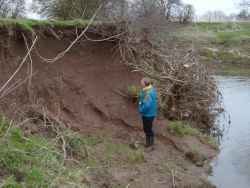 The inset gives some idea of the height that the river has risen in order to flood the meadow. Where we are at the moment, the bank is lined with trees. 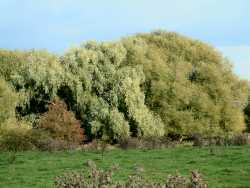 The majority are willows (Crack Willow and White Willow); others include Alder, Ash, Hawthorn, Lime and Maple to name a few. 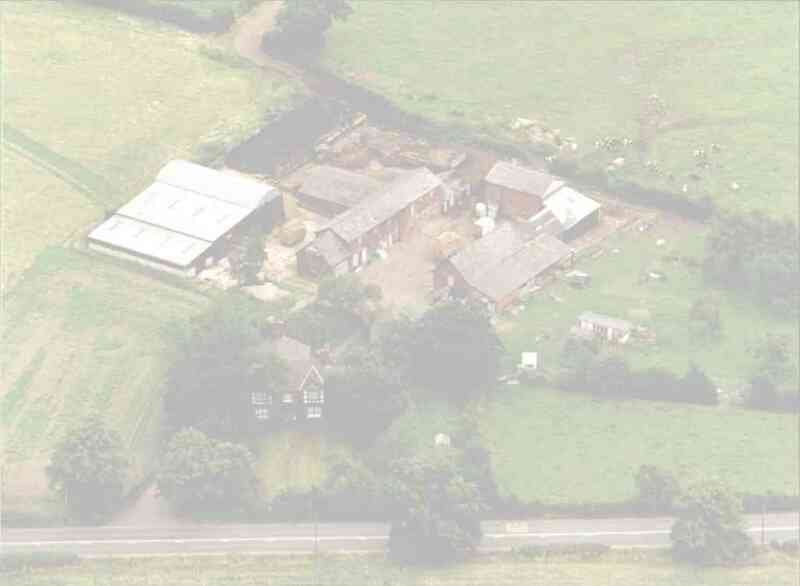 As this picture shows, in places the growth is quiet dense, this area of the farm forms part of the Countryside Stewardship Scheme in which we participate. 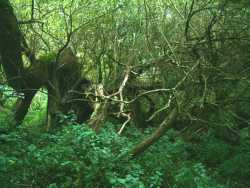 As such it is left in a completely natural, and undisturbed state. 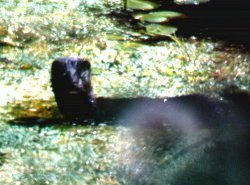 Mink, (which is not a native animal to the UK) were originally captive bred for their fur, however some accidentally escaped, while others were deliberately released by well meaning but rather short-sighted groups of people. With no effective natural enemies to control their population, they are becoming an increasingly common sight. 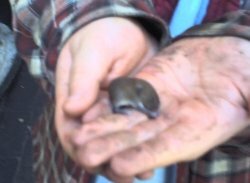 Voles use to be common, however with the introduction of the mink, the population of voles and indeed other small mammals, has declined noticeable (though I doubt this is entirely the fault of the mink). Continuing to walk along the bank you may see an occasional brilliant flash of turquoise and orange, this is the Kingfisher Sadly in this case somewhat camera shy. 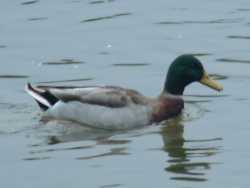 A somewhat more co-operative bird to photograph is this mallard, which is a type of duck. Just then, a movement in the corner of our eye draws our attention to this Treecreeper. 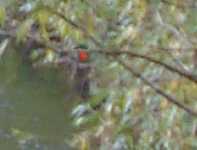 It moves jerkily as it searches for insects and their larvae on the bark of the tree. Moving a little farther up stream, the trees begin to thin out and the going gets a little easier. With the trees being replaced by grasses and other plants such as Thistles, Nettles, Butterbur, Willow herb and also the invasive Himalayan balsam to name just a few, we can see an example of the more distinctive power of the river. Treading carefully, and not too close to the bank, we find that here a large part of the bank has slumped down into the river. Without the deep penetrating roots of the trees to help provide a moderate level of stability the soil is easily eroded. 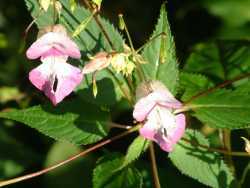 It is at this point, we leave the banks of the River Dane and walk up along the hedge dividing the Middle Meadow and the Heifer Meadow as we make our way to the seventh stop on our trail. The Middle and Heifer Banks.